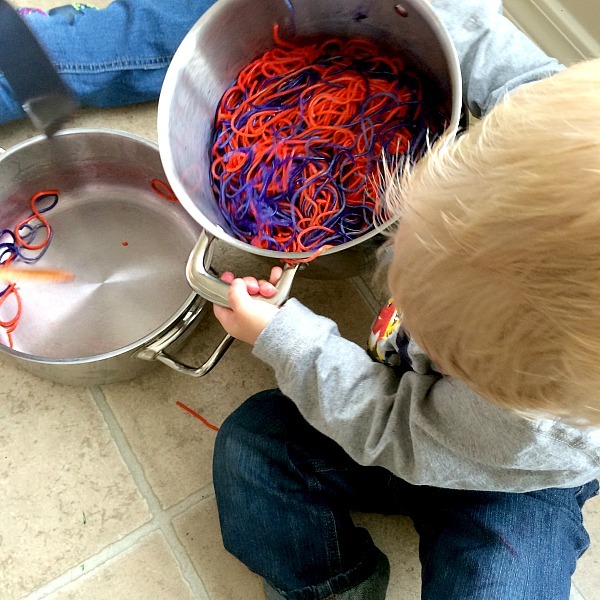 Home » Crafting » Rainbow Pasta Playtime! Inexpensive Fun. 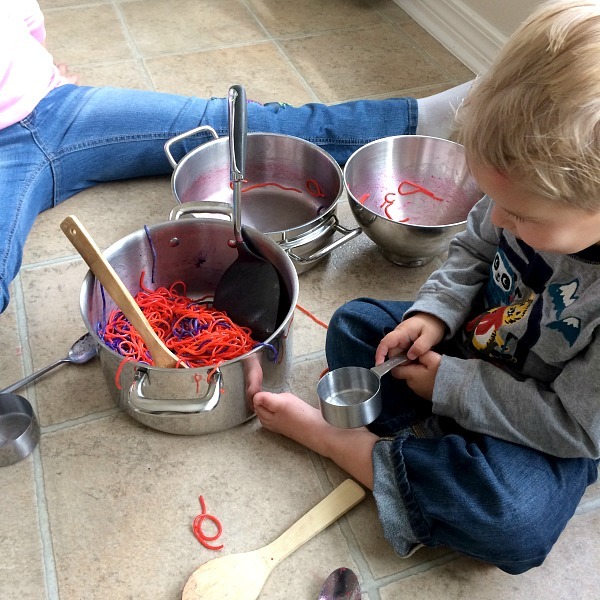 Rainbow Pasta Playtime! Inexpensive Fun. Sunday morning I woke up and knew that we needed to have a bit more fun on the weekends. All week long we play, we learn, we whine….ok, maybe that’s just me, but by the time weekends come all Chris and I want to do is play paper, rock, scissors on who has to get up with the kids at 7am. So the first thing I did when I got up Sunday was boil spaghetti. I had seen on the front of one of Charlotte’s kid magazines a girl holding a fork with rainbow noodles. While I never found an article on it, I knew it was a logical process. 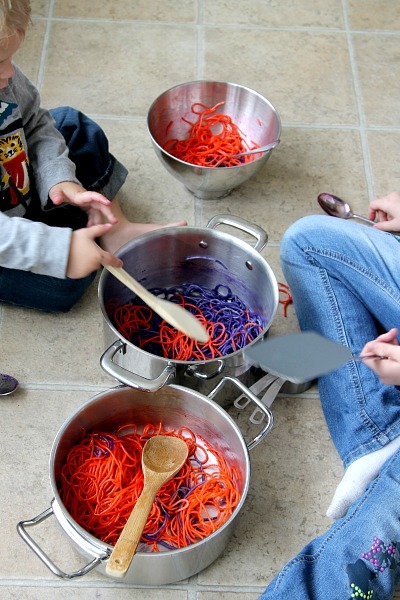 What I didn’t know was how much FUN we would have playing (nope, not eating) with dyed noodles. I even got a “Woah, cool!” out of my spouse. And it was. For the record my camera battery dyed, so its all iPhone shots. I still hope you get an idea of the fun! First things first. Boil up your spaghetti. It really doesn’t matter what kind you get. The good old cheapy dollar general box is just fine. I suggest you make a whole box. This is pretty fun and you will want lots of colors! I under made for as long as we played. 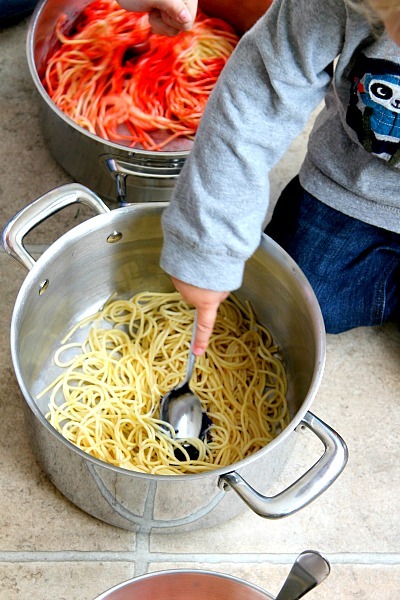 Separate your spaghetti into a variety of bowls and then add food dye with a tsp of olive oil. The oil helps keep it from sticking together. For the dye I use the kind that comes in little tubs rather than the liquid kind, but I am sure its irrelevant either way. I actually just added the dye but gave the kids a spoon so they could do the mixing. After all, watching the noodles go from yellow to red or blue or green is half the fun! 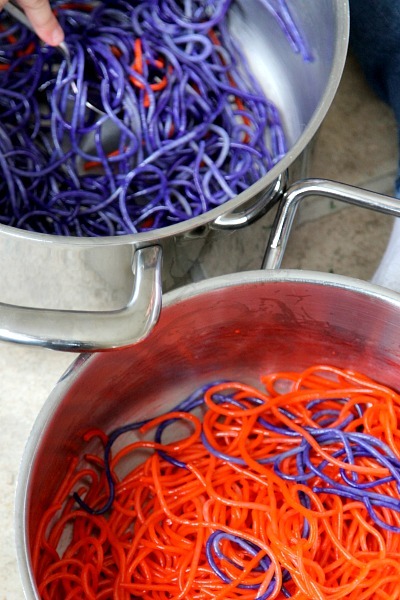 After you have all your dyed up pasta, add some measuring cups and wooden spoons. 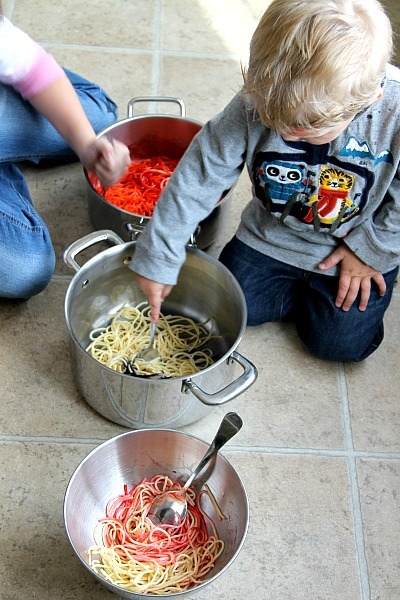 The kids had a blast transferring the noodles and mixing them up. Finally my daughter decided to put her hands in and it got a bit crazy after that. 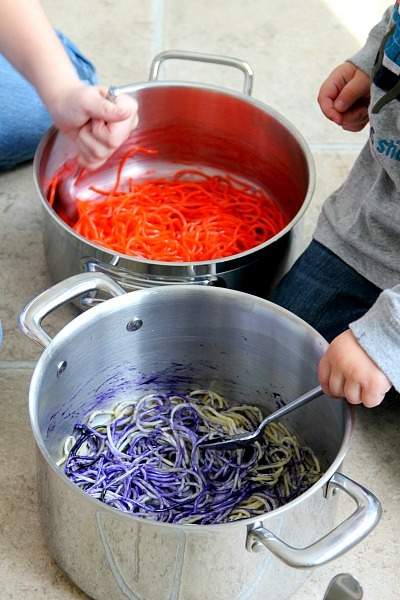 While eating dyed noodles is totally up to you, I personally did not let the kids eat them…this was just for play. That doesn’t mean the dog didn’t sneak off with one. Cost? Maybe $1 total….fun? Hours. They played this for about an hour and then my son went into the tub and my daughter took the noodles outside with her friends to “experiment”. She told me adding water made it super mushy. At any rate, everyone had a great time. If you are wondering, it did turn their hands a few shades of pink, which easily came off with soap and water. Such a fun idea and so icky! Would love for you to share at Fridays Unfolded! What a fun play activity for the kids! they are so lucky to have a mom who will play creatively with them!! This looks like so much fun! I need to do this with my stir crazy kiddos! oh my goodness so much fun! The smile on your sons face says it all! Those pictures are adorable. Crafts like these always keep my kids distracted the longest! I love that you are brave enough to be messy. Looks like they had a great time, and what a great learning experience! 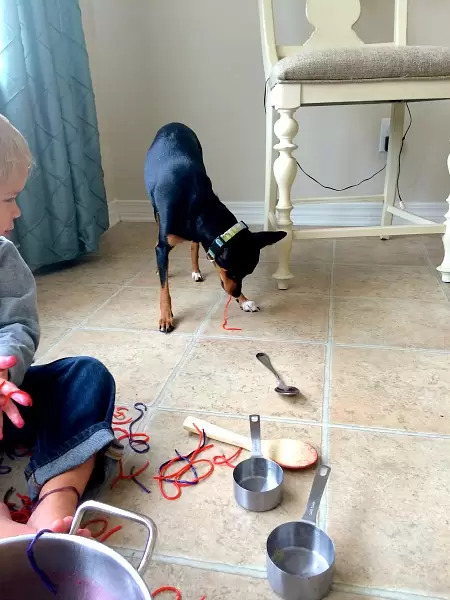 This looks so fun – I mean fun for the kids of course 😉 I LOVE P’s face in the photo above the dog stealing a noodle! We’ll have to give this a try.. This is a fun idea that wouldn’t cost me anything. I always keep all these supplies on hand. My kids would love this! I’ll have to try it! Looks like P is having all kinds of fun lately! What a fun project for the two of you. 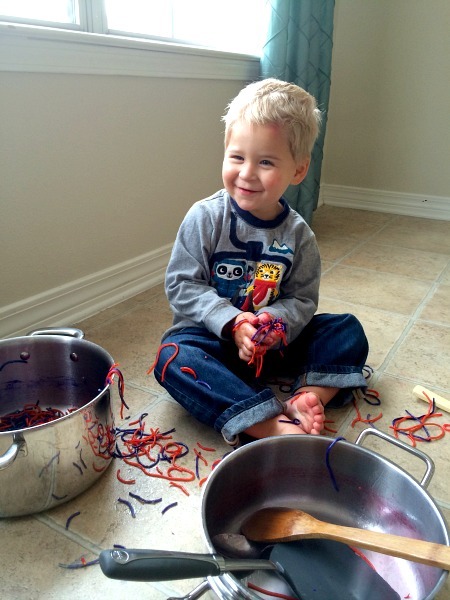 I love the look on your sons face when he stuck his hands in the pasta the first time! !